SERVICE DESCRIPTION - PLEASE READ IN FULL! 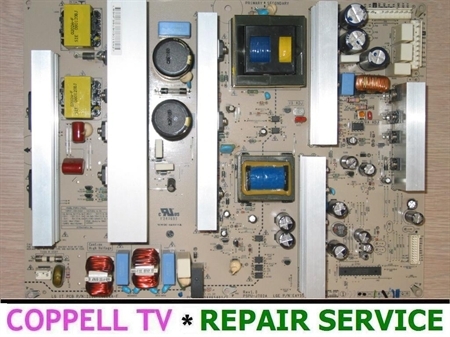 Coppell TV Repair offers a REPAIR SERVICE for power supply board EAY39190301 / PSPU-J702A as shown on the pictures. REPAIR SERVICE means that you need to send us your malfunctioning board that we will attempt to service, test and return to you. 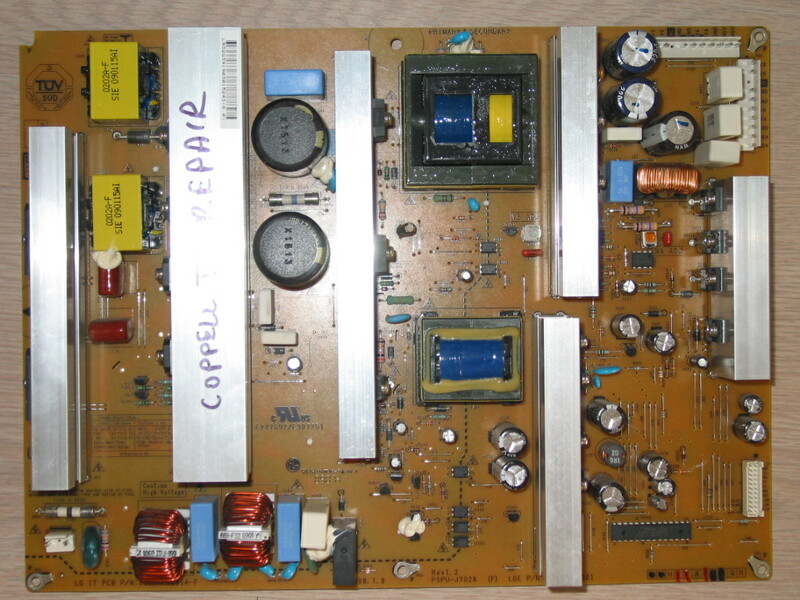 There are several different modifications of this power supply and this listing applies to all of them provided they carry the EAY39190301 identification label. The repair service is not limited to the described failure symptoms. We do what needs to be done to get the board working, provided it meets the below specified requirements. Failure in power supply board EAY39190301 is usually indicated by either a completely dead TV (no front LED, no response to any command) or just a pair of clicks (click on and then click off) upon attempt to turn on the TV. Other failures are also possible, of course, and unfortunately some of the symptoms can also be caused by other failures in the TV. The most simple and fairly reliable (though still not 100% certain) way to test the board is to disconnect all cables from its connectors except the AC power cable. Upon supplying 110V AC power to the board it should click once and remain that way. Vs should then be present and should be measurable with a simple volt meter. Upon disconnecting AC power to the board it should click back off. If it does not respond to connecting AC power or if it clicks on and then right back off then there is a problem with it. For more details see this article at our blog. Typical processing time for the repair is within two business days; if we have any probems that require more time (be it overload or technical problems) we will contact you with an update and request for more time. We have a fairly high success ratio, but we still do not guarantee success; if we can't get the board to work, though, you will not need to pay. Presently we do not charge in advance for repair services. Instead, once the board(s) are received, tested, found to be defective, serviced and tested again to success we send a payment request to the customer. If something along the process - such as unexpected difficulty or finding a board to be functional - arises we contact the customer via email and/or phone and disscuss options. 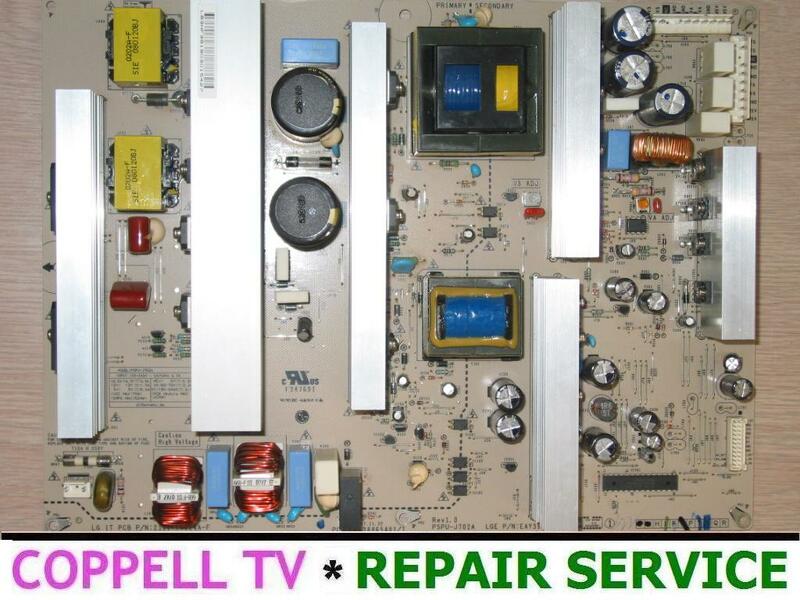 If a board arrives and is determined to be functional we charge up to $25 for diagnostic fee. For explanation of why do we do that please read this article. We ask that the board arrives here in good physical condition and without traces of tampering. If someone (other than us, that is) has already attempted to service the board then please contact us with a description/pictures and do not directly place an order. We reserve the right to refuse service to boards that have signs of repair attempts.